A teenager who stabbed a shop worker at least 19 times in a motiveless attack is to be detained indefinitely. 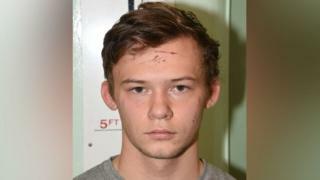 Ethan Mountain, 19, attacked 62-year-old Joan Hoggett at the One Stop shop in Fulwell, Sunderland, on 5 September. Mountain who had paranoid schizophrenia, previously admitted manslaughter on the grounds of diminished responsibility. He remained a significant risk to the public and was to be held under the Mental Health Act, the judge ordered. Following the minute-long attack, Mountain left behind a holdall containing a hammer, a sheathed samurai sword, machetes and three knives. The great grandmother was found with 19 stab wounds. Prosecutors accepted Moutain suffered from paranoid schizophrenia, but argued he had demonstrated rational behaviour in the hours before the killing. CCTV footage played to the jury showed the masked defendant, of Heaton Gardens, South Shields, entering the shop and producing a knife. The killer was sectioned when he was 17 after being diagnosed with paranoid schizophrenia but was later released from hospital. Two psychiatrists agreed he was suffering from the mental disorder when he killed Mrs Hoggett. He will be detained at Rampton Hospital, a high security psychiatric facility. Mr Justice Butcher, said: "Taking into account the nature of the killing of Joan Hoggett, and all that I have heard about you, I consider that it is clear that you pose a significant risk of causing serious harm to members of the public by committing other offences." The judge said the violent killing had devastated Mrs Hoggett's relatives, and that she was the "rock" of their family.